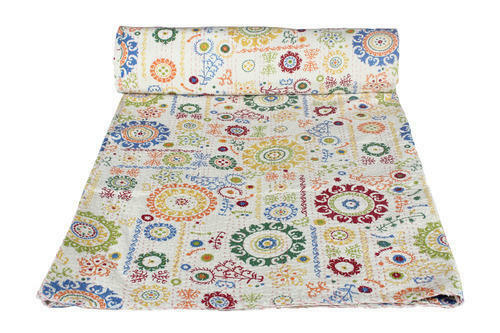 Our organization is known for offering a wide range of Badmeri Kantha Designer Bed Sheets. These bed sheets are designed using optimum quality fabric and advanced tools. Moreover, we offer these bed sheets in classical and contemporary designs to suit the multiple requirements of our clients. Material: 100% CottonFilling: CottonPattern: PrintedAge Group: AdultsSize: QueenTechnics: HandmadeUse: Home, Hotel, OtherPlace of Origin: Rajasthan, IndiaBrand Name: "Handmade"
Add an elegant appeal to the furnishing with the decorative Kantha Work Bedsheets that exhibits the royalty of mughal era. 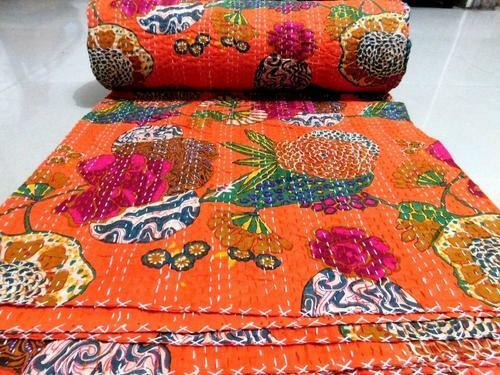 Check Out our beautiful collection of HANDMADE DESIGN Kantha WORK Gudari. This traditional handwork is done by a tribal castle called”KANTHA”in country side of rural India. Wholesale lots of 50,100,200 pieces are available at discounted prices to retailers, wholesalers,chains stores,departmental stores directly from manufacturer in India. 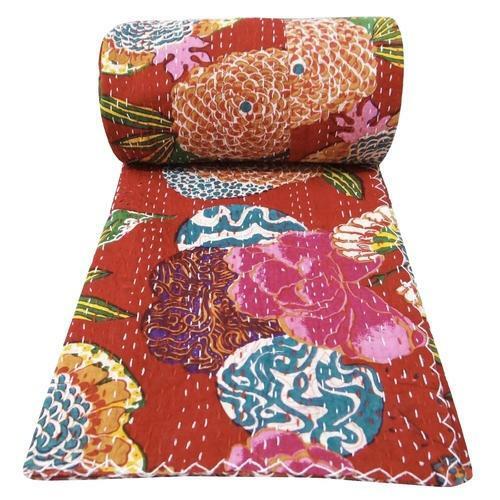 Add an elegant appeal to the furnishing with the decorative Kantha Gudari that exhibits the royalty of mughal era.Check Out our beautiful collection of handmade design Kantha(taka) work bedcover .This traditional handwork is done by a tribal castle called”KANTHA”in country side of rural India. Wholesale lots of 50,100,200 pieces are available at discounted prices to retailers, wholesalers,chains stores,departmental stores directly from manufacturer in India. Indian Traditional Kantha work vintage old gudris made from pure organic cotton .This is block print on cotton fabric.These products are pasiley designed and developed by our creative team of professionals by keeping in consideration the specific requirements of clients.To ensure the delivery of quality tested range in the market, our company has implemented total quality management principles in its business activities.We are the leading supplier manufacture wholesale and exporter of all type of cloth items like home furnishing, garments items, textiles, Block print fabric items. 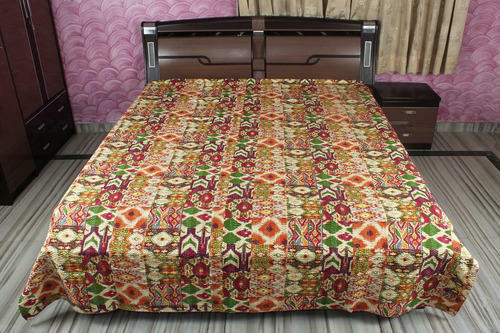 Double Bed Sheet in traditional sanganeri print of Jaipur.This bed sheet is a designed in ethnic style for modern era.This handmade Print BedSheet stitched by rajasthani (Jaipur, India) designers Traditional rajasthani printing on these bed sheets is done by Paisley print tie and dye using multicolor pattern.On Print bed sheet embroidery is done on layers of cotton with multicolor threads all over.This bed sheet gives your modernly designed house an ethnic corner. 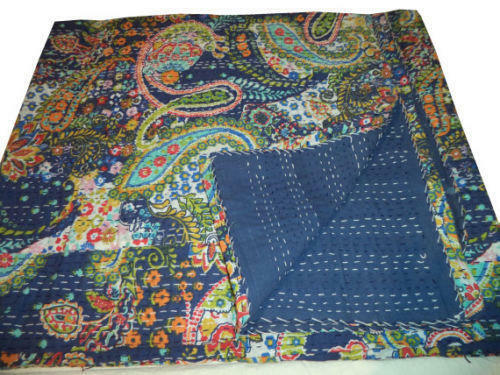 Wholesale bedsheet, cotton kantha quilt bedcover/ handmade new paisley design print bedsheet manufactur.We are offering a wide array of Multi-Coloured Kantha Bedcovers that is made using quality material. 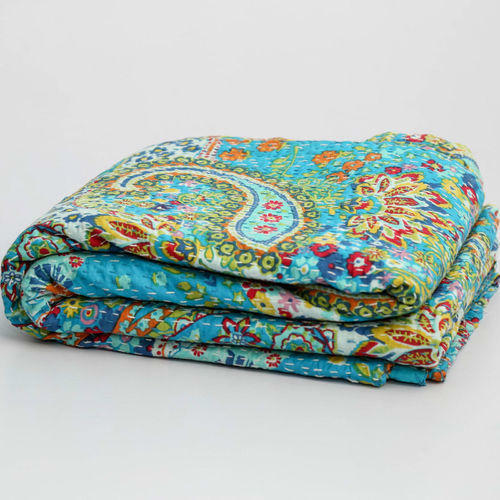 High grade cotton is been used to manufacture these Multi-Coloured Kantha paisley design print. 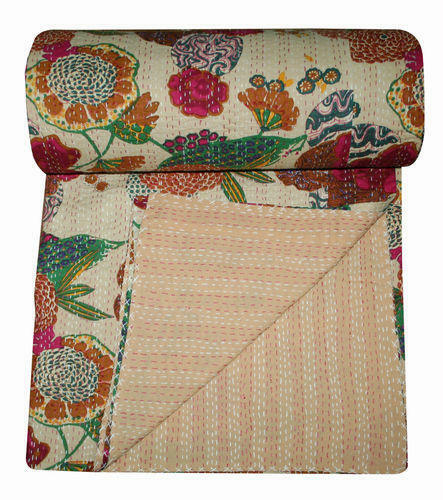 Our Multi-Coloured Kantha Bedcovers are available in the market at reasonable rates. The offered products are available in various cuts and looks. . Moreover, our products are available in unique prints. Double Bed Sheet in traditional sanganeri print of Jaipur.This bed sheet is a designed in ethnic style for modern era.This handmade Print Bed Sheet stitched by rajasthani (Jaipur, India) designers Traditional rajasthani printing on these bed sheets is done by Paisley print tie and dye using multicolor pattern.On Print bed sheet embroidery is done on layers of cotton with multicolor threads all over.This bed sheet gives your modernly designed house an ethnic corner. Indian Traditional Kantha work vintage old gudris made from pure organic .These products are pasiley disgned and developed by our creative team of professionals by keeping in consideration the specific requirements of clients.To ensure the delivery of quality tested range in the market, our company has implemented total quality management principles in its business activities.We are the leading supplier manufacture wholesale and exporter of all type of cloth items like home furnishing, garments items, textiles, Block print fabric items. 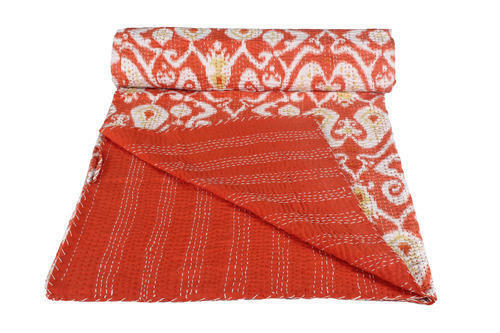 Our customers can purchase from us Indian Printed Kantha Bedcover which is innovatively designed by our expert weavers using fine quality materials, fabrics and advanced machines. This is available with us in contemporary designs in order to meet the diverse requirements of the customers. 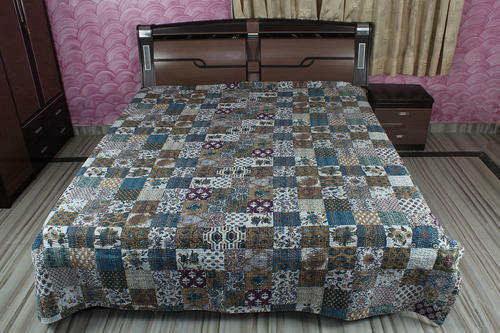 This quilt keeps the user warmth in winter due to the usages of fine materials. 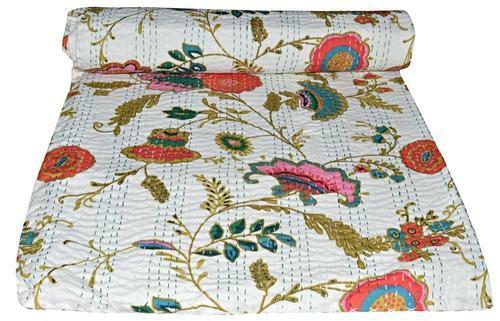 Designed as per the define industry standards, this quilt can be further custom made as per the requirements of the customers. 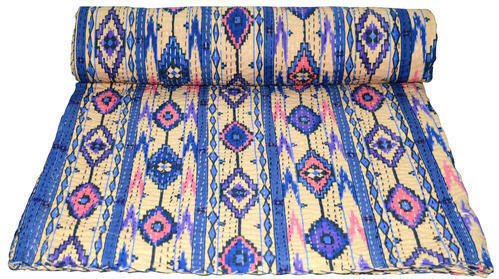 This is a Brand new Colorful Kantha Stitched Bed Cover from Jodhpur, Rajasthan. Jodhpuri Katha Work Double Size Bedsheet Gift set contains: A. 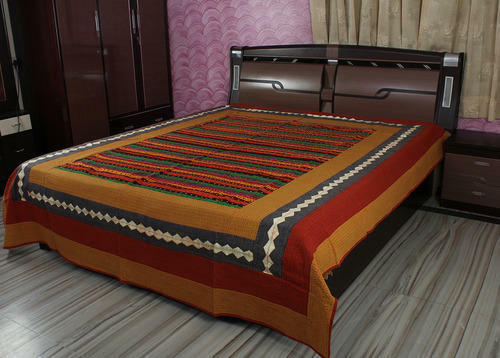 Specifications: The bedsheet is having traditional Sindhi Katha work style of stitching done all over. This gives ethnic and special look to it. It uses 100 % Export Quality pre-shrunk voil cotton of thread count 88x106. B Guaranteed fast & vibrant colours. The product presents a good example of traditional craftsmanship of Rajasthan. These good looking, fluffy bedsheets are a specialty of Jaipur. You receive the exact color, design and pattern as shown.Wholesale lots of 50,100,200 pieces are available at discounted prices to retailers, wholesalers,chains stores,departmental stores directly from manufacturer in India. 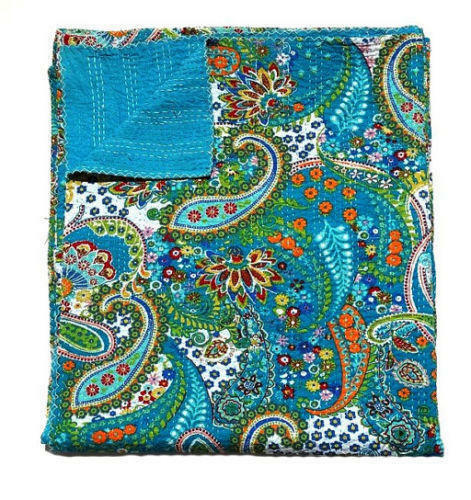 This is a Brand new Colorful Kantha Stitched Bed Cover from Jodhpur, Rajasthan.Jodhpuri Katha Work Double Size Bedsheet Gift set contains: A. Specifications: The bedsheet is having traditional Sindhi Katha work style of stitching done all over. This gives ethnic and special look to it. It uses 100 % Export Quality pre-shrunk voil cotton of thread count 88x106. B Guaranteed fast & vibrant colours. The product presents a good example of traditional craftsmanship of Rajasthan. These good looking, fluffy bedsheets are a specialty of Jaipur. You receive the exact color, design and pattern as shown.Wholesale lots of 50,100,200 pieces are available at discounted prices to retailers, wholesalers,chains stores,departmental stores directly from manufacturer in india. 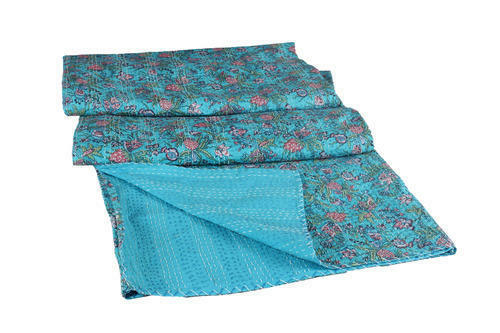 Due to Kantha stitches it gives enough strength and durability for washing and also it can be Hand washed.The entire quilt is hand embroidered with end number of straight stitches to create a unique product, one of a kind, thus it’s a perfect GIFT too.All these make them a Kantha Quilt.We are 100% sure that you will love these beautiful Kantha quilts forever once you bought It. 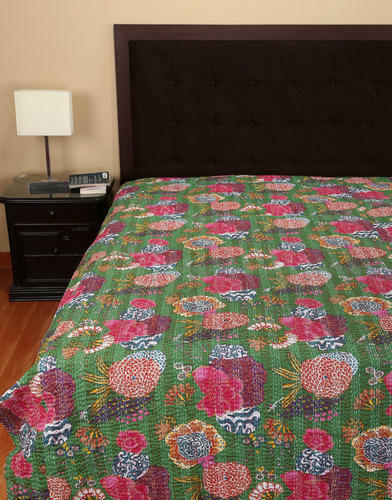 This gorgeous quilt will add warmth style and elegance to any room in your home. Its superb quality and design will make you proud of your purchase. 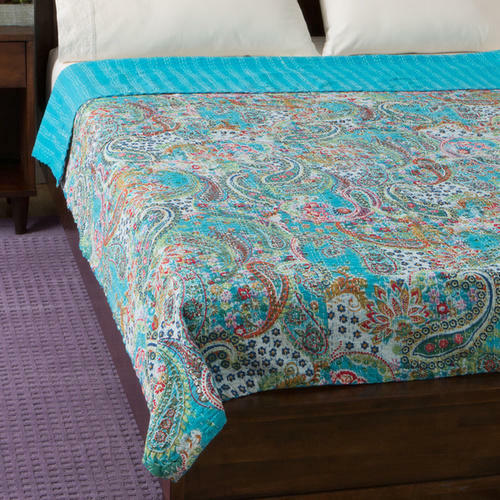 Wholesale bedsheet, cotton kantha quilt bedcover/ handmade new paisley design print bedsheet manufacture.We are offering a wide array of Multi-Coloured Kantha Bedcovers that is made using quality material. 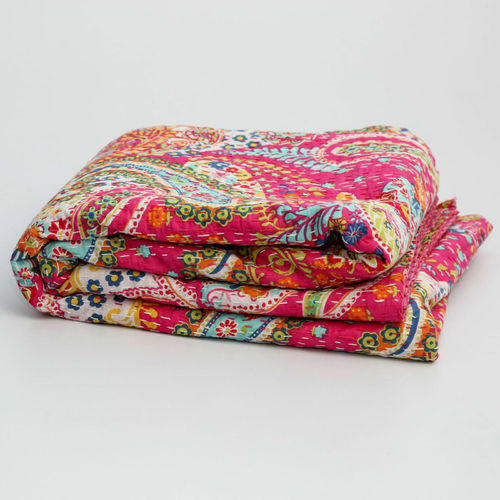 High grade cotton is been used to manufacture these Multi-Coloured Kantha paisley design print. 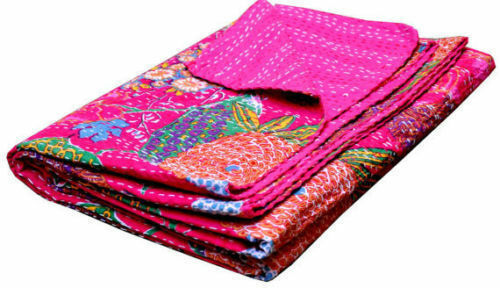 Our Multi-Coloured Kantha Bedcovers are available in the market at reasonable rates. The offered products are available in various cuts and looks. . Moreover, our products are available in unique prints. 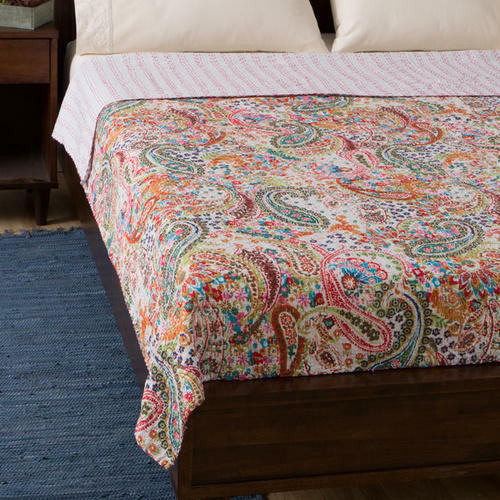 Wholesale bedsheet, cotton kantha quilt bedcover/ handmade new paisley design print bedsheet manufacture.We are offering a wide array of Multi-Coloured Kantha Bedcovers that is made using quality material. 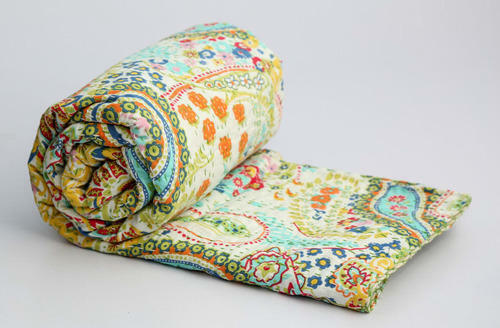 High grade cotton is been used to manufacture these Multi-Coloured Kantha paisley design print. 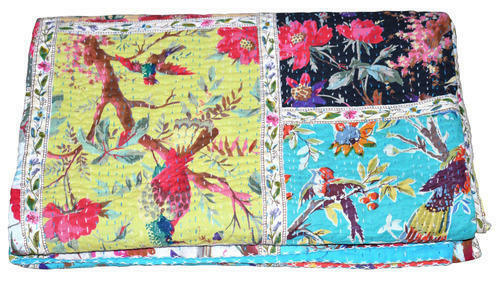 Our Multi-Coloured Kantha Bed covers are available in the market at reasonable rates. The offered products are available in various cuts and looks. . Moreover, our products are available in unique prints. 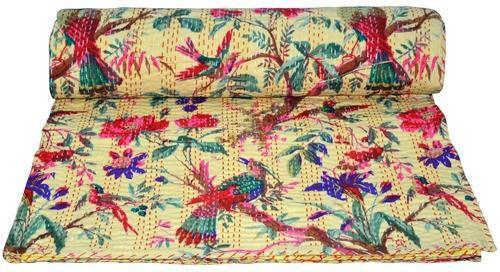 Ram Dev Handicraft Offers you handmade cotton kantha work bird print bedspread. 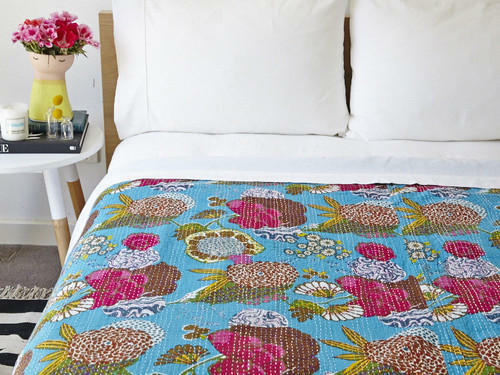 Now bring this soft cotton bedspread for you and you can gift it to your friends and relatives. 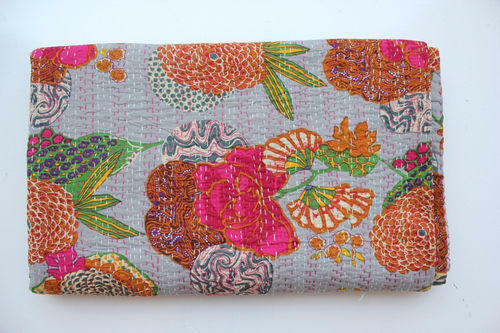 It is made from Jaipuri cotton fabric and adorn with handmade kantha work by our hard working team. 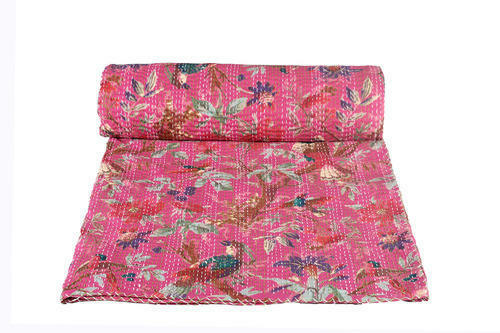 We are manufacture sapplires and wholesaler of our cotton kantha work bird print quilt and also cotton cushion covers, bedspreads. We are the leading supplier manufacture wholesale and exporter of all type of cloth items like home furnishing, garments items, textiles, Block print fabric items. Indian Traditional Kantha work vintage old gudris made from pure organic cotton. This is screen print on cotton fabric. These products are traditional disgned and developed by our creative team of professionals by keeping in consideration the specific requirements of clients. To ensure the delivery of quality tested range in the market, our company has implemented total quality management principles in its business activities. 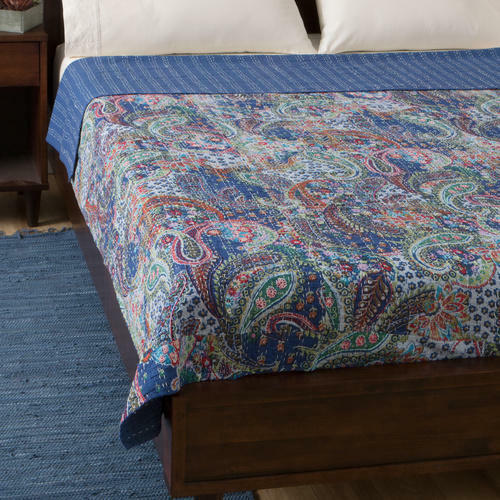 A beautiful handmade Kantha embroidered cotton floral & paisley design bed sheet. This piece has embroidery and kantha work on the front side floral print. This unique bedsheets has expertly crafted using traditional methods which is inexplicable charm of this bed cover art. 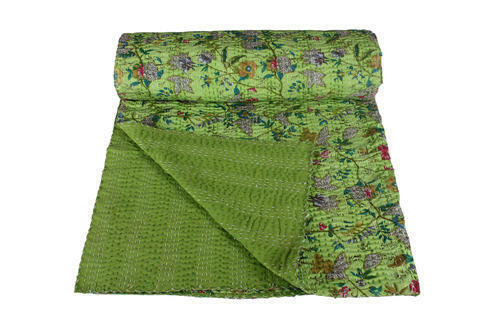 This gorgeous kantha bedspread gudari will add warmth style and elegance to any room in your home. 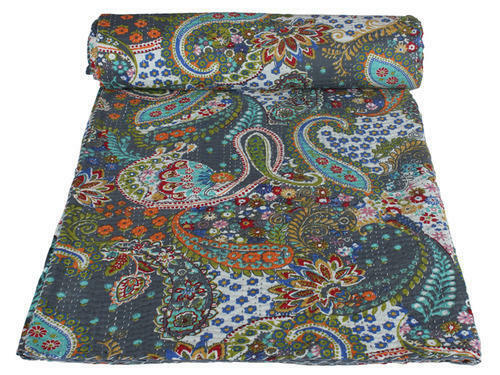 Its superb quality and paisley design will make you proud of your purchase. 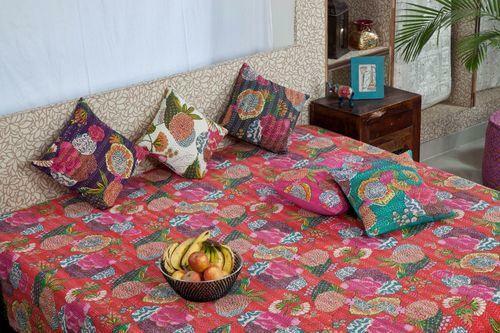 Barmeri Double Bedsheets cotton fabric. It is decorated with handmade kantha work. 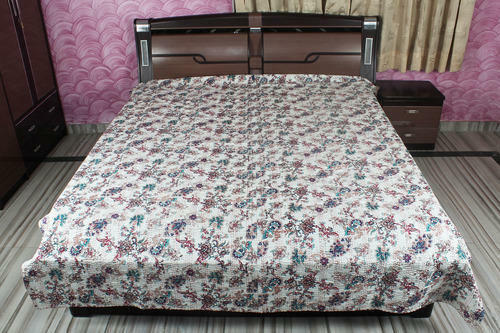 Decorative handmade cotton double bed sheets. 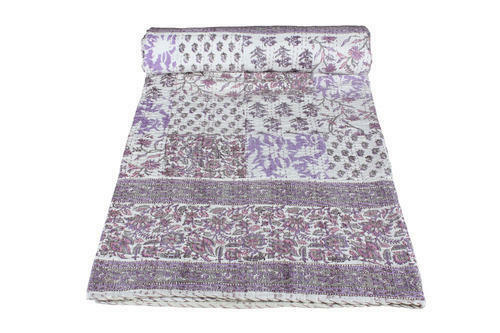 Bring this radiant handmade embroidered kantha work designer cotton bed sheet to decorate your home. It is totally handmade product. Handmade by our hardworking team. 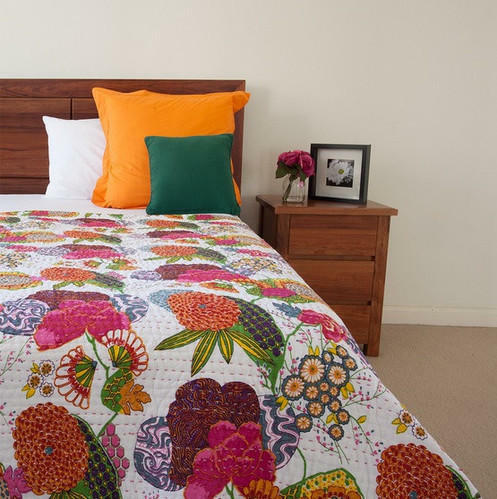 We are manufacture, supplier, explorer, retailer and wholesaler of our handmade cotton and silk material products like cotton silk cushion cover, bed sheet, quilts, woman jackets. 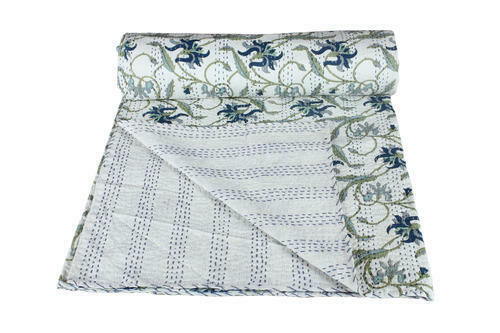 Our Indian Kantha Bedspread are designed with soft padding of cotton,combinations of fibres enclosed between layers of fine quality fabrics with decorative stitching. These quilts are specially designed for kids in linear alignment to give an ecstatic feel and comfort. This particular product which our professional team of designers and craftsmen have conceived, is available in different shapes and is designed in various patterns with assured quality. This is a Brand new Colorful Kantha Stitched Bed Cover from Jaipur, Rajasthan.Jaipuri Katha Work Double Size Bedsheet Gift set contains: A. Specifications: The bedsheet is having traditional Sindhi Katha work style of stitching done all over. This gives ethnic and special look to it. It uses 100 % Export Quality pre-shrunk voil cotton of thread count 88x106. B Guaranteed fast & vibrant colours. The product presents a good example of traditional craftsmanship of Rajasthan. These good looking, fluffy bedsheets are a specialty of Jaipur. You receive the exact color, design and pattern as shown.Wholesale lots of 50,100,200 pieces are available at discounted prices to retailers, wholesallers,chains stores,departmental stores directly from manufacturer in india. Indian Traditional Kantha work vintage old gudris made from pure organic cotton .This is block print on cotton fabric.These products are pasiley disgned and developed by our creative team of professionals by keeping in consideration the specific requirements of clients.To ensure the delivery of quality tested range in the market, our company has implemented total quality management principles in its business activities.We are the leading supplier manufacture wholesale and exporter of all type of cloth items like home furnishing, garments items, textiles, Block print fabric items.